Yankees television play-by-play broadcaster, Michael Kay was at Madison Square Garden tonight decked out in full New York Rangers gear after losing a friendly bet to Don La Greca. -The first time George Steinbrenner was referred to as “The Boss”. You should really check out Mary Jane’s other blog posts, as she recounts some of her memories with George. The guys over at New York Barstool Sports are debating who is the “Bigger Yankee Fan Douchebag”. Options include the fan wearing a Michael Kay T-Shirt or the fan in the bleachers who pretends he’s playing the outfield. On a 2-0 pitch, Alex Rodriguez launched a 2-run home run (off a 85mph fastball from Shuan Marcum) in the bottom of the 1st inning to put the team up 2-0 over the Blue Jays. It was the highly anticipated home run that everyone has been waiting for. It took him 46 at-bats, but he’s finally in the 600HR club, joining Bonds, Aaron, Ruth, Mays, Griffey and Sosa. Alex is now the youngest player to ever hit 600HR’s, just 8 days past his 35th birthday. He actually hit in on the same day (August 4, 2007) that he hit HR #500. Funny enough, the ball landed in Monument Park and a Yankee Stadium security guard picked up the ball. I guess that belongs to the Yankees now, and it will go directly to Alex Rodriguez. The Yankees organization was prepared to give the fan a autographed baseball, jersey, hat and bat from Rodriguez. If that wasn’t enough, they were going to offer the person lunch with A-Rod and Cameron Diaz. (Via Jack Curry: Michael Kay passed this along during the YES Network broadcast). Congrats Michael! I’m sure Paul O’Neill is happy about this! 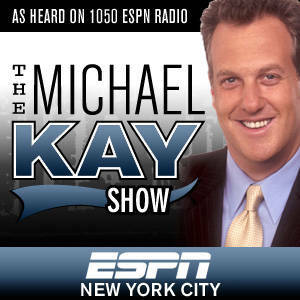 Jerry: Michael Kay… Elaine: Yeah? Jerry: Is getting married! Elaine: Get out! Listeners of Michael Kay’s ESPN afternoon-drive radio show may not know it, but the beautiful girlfriend he sometimes talks about is News 12 Long Island anchor Jodi Applegate. The couple have been dating for a little over a year now, and Applegate tells Gatecrasher that they met after Kay, the TV voice of the Yankees on the Yes Network, spied her from afar at the 2009 Emmy Awards. The next day, he waxed romantic about the former “Good Day New York” anchor at length on his ESPN show, telling the audience that Applegate was his idea of the “perfect woman” – “so perfect” that he couldn’t bring himself to talk to her. When Applegate heard about Kay’s on-air mash-o-logue, she says her response was, “Michael who?” But she ended up calling Kay’s producer and, without letting the sportscaster in on the goof, phoned in to his show the next day as “Jodi from Long Island.” Their call went on for 12 minutes, and when Kay realized he was talking to his idea of the perfect woman, “he began asking me out on the air,” Applegate says. The News 12 anchor turned him down because she was seeing someone at the time, but when she found herself unattached a few months later, she e-mailed Kay. After a first date at Pomodoro restaurant in Hell’s Kitchen, “we’ve been together ever since,” she says. They even attended this year’s Emmys together. Way to go Michael! I’m sure Paul O’Neill will continue to bug him about getting married…. “I wish I could overtake Mike Francesa. I try to do that every single day. And you have the nerve every day to hammer that guy and John Sterling? For the last 20 years you’ve written the same column. Now you’ve gone too far when you question the fact that I steal people’s ideas, when I don’t have enough of a frame of mind to come up with my own stuff, I have to steal people’s ideas without giving them credit? I don’t do it. I’ve never done it. And you write an open-ended thing like that without giving a specific case? How dare you? “First things first: Who the hell are you to scold me? My mother and father scolded me and they’re dead. You’re not, OK? Don’t ever scold me. You don’t have that right to be scolding me, nor do you have that gravitas. You’re nothing, OK? And what you wrote is untrue. Because of all the people that you talk to, even people at this station, I’m obsessed with giving credit. Some of my best friends in the world are newspaper writers and I always give credit. “If I inadvertently or unknowingly gave the same kind of thought that was in a newspaper column without crediting it, well then I apologize for that. But I want you to tell me what I did and when I did it. Because the way you write it it’s like it’s a constant thing, and that’s fraudulent on your part. Fraudulent. That is not true. And I’ve got stuff on you. You want to question ethics? I’ll bring it out, too. I’ve got plenty of things that would question your ethics and your morals and the way you do your job. And I’m going to leave it open-ended, too. How does that feel? “You guys have thin skins. If you think about, what are critics? Critics are parasites that live off the work of others and critique it. Do something on your own. I’d never steal a line from your column, Phil, because I know every single day exactly what you’re going to write. Whether it’s Sterling, Flatherty, Waldman, Kay, or any of the other YES Network and WCBS 880 broadcast members, the fans always have something to complain about. It could be the crazy home run calls by Sterling, Kay’s big head, or the boring Flatherty (I don’t think he is). You even hear people make rude comments about the lovely Kim Jones. I just don’t get it. Every person has their own quirks, and if you don’t like them for any reason..why don’t you just mute the tv? Nobody is forcing you to listen to these games. You can say the same thing for Buck and McCarver. If you hate them so damn much, just turn off your television. People don’t realize how hard and grueling these jobs really are. Let’s remember that these guys call and report from a 162-game season. I was actually waiting outside the press gate the other day, after that grueling loss to the Tribe and I had the chance to meet Michael Kay and John Sterling. I could see they were both in a rush to leave the ballpark, but they took the time to shake my hand and sign a baseball for me. Even Suzyn Waldman waved hello. I’m just sick and tired of all the complaints and rude comments these people have to hear. It’s unnecessary.